Fun songs always make me happy and I can remember only one person and that is great legend Kishoreda, yes “Kishore Kumar Ganguly”. What a great personality he was! 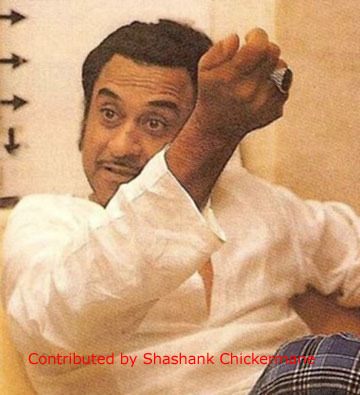 He was an allrounder and one of a kind and seldom will we get to see someone like him in our Bollywood film industry.. He was versatile in his singing. As an actor he could handle both comical and serious roles with great spontaneity. They called him an eccentric person but he was special in everyway he could be. His was close to Danny, Mangeshkar sisters, Director Shakti Samanta, Iftekar, Dev Anand, Sanjeev Kumar, music director R.D.Burman and Mehmood. He was unique as a composer, film-director, lyric writer, story writer, actor, singer, producer and director as well. His co-singer Lata Mangeshkar called him a “Sampurna Kalakar”. As an actor he had many hit movies to his credit – Half Ticket, Miss Mary, Ganga ki Lehre, Chalti Ka naam Gadi, Padosan, Bombay to Goa (Guest Appearance) and many other films. He sang many songs under R.D.Burman’s music direction. Kasme Vaade, Shaan, Sholay, Barsaat Ki Ek Raat, Satte pe Satta, Shakti, The Great Gambler and many other films. They musical relationship was a long and a fine one in the film industry after R.D’s father gave Kishoreda the momentum with the songs in Aradhana. Each song that he sang for S.D.Burman were melodious and memorable. One cannot forget the song from Mili – “Aaye Tum Yaad Mujhe” and “Badi Sooni Sooni Hai.” Kishoreda gave playback for many heros and super heros Devanand, Rajesh Khanna, Amithab Bachchan, Sanjeev Kumar and also many other famous stars. He has given brilliant numbers with Mohd Rafi, Mukesh, Mannadey, Lata mangeshkar, Asha Bhosale and many other singers. Kishoreda songs with his son Amit were equally great number. Kishorekumar also directed, produced, wrote and composed for some films like Door gagan ki chaav mein (1961), Shabash Daddy (1978), Badti Ka Naam Dadhi (1974) and Mamta Ki Chhaon Mein. Almost all Amitabh Bachchan movies had Kishore singing for this living legend. Kishore, during his lifetime gave many concerts in India and abroad. He sang songs of all generes not just in Hindi and his mother tongue Bengali, but also in other languages as Assamese, Gujarati, Oriya, Malayalam and Marathi. His last song was composed by Bappi Lahiri for the film “Waqt ki Awaaz” on 12th Oct 1987, the song was “Ae guru aa jao”. 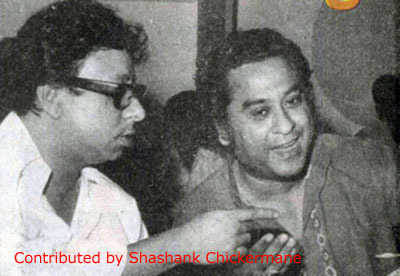 On 13th Oct 1987, which was also his elder brother’s birthday, Kishoreda suffered a massive heart attack that evening. He passed away at an age of 58. The tragedy shook the film industry massively for there went away a legend to land of no return. It was probably the saddest day for all his fans. Almost the whole film industry came to pay their last tribute to this versatile singer. Some of the personalities were Rajkapoor, Dilip Kumar, Saira Banu, Pran, R.D.Burman and many film personalities. 20 years have passed by, but he continues live amongst us in his voice and the great songs that he has left for us to treasure and preserve. Kishoreda Amar Rahe! 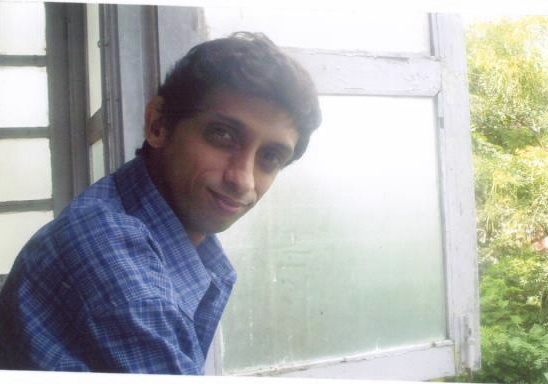 This entry was posted on Monday, February 25th, 2008 at 2:23 pm	and is filed under Kishore diary. You can follow any responses to this entry through the RSS 2.0 feed. You can skip to the end and leave a response. Pinging is currently not allowed. JUst a few words from me to all of those who real fan of shree Kishore Kumar jee. No matter how many singer come and go. there will be no one like a KISHORE KUMAR. so please please dont try to hurt his soul, let it rest in peace. 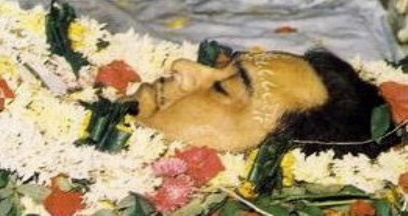 I can’t express my feelings about kishore Kumar. He is a legend and I think untill the end of this world he will be live in our heart. I LOVE KISHORDA ,AAP KI YAAD HAMAISA JINDA RAHAIGI DIL ME ,WORLD MAI, JOB TAK DUNIYA RAHAIGE . AAP KE SONGS MAI AISHI JINDAGI HAI KI SUAN KAR LIFE KI PROBLEMS FINISHED HO JATI HAI . I VERY HAPPY KI AAP JAISHA MAHAN SINGER JISNE JINDAGI KI HAR PROBLEMS KO GANOO SE SULJHNE KI KOSHIS KI ,,,,AAP NE JO BHI SONGS GAAYA := RUK JANA NAHI TU KAHI HAR KE ,,GADI BULA RAHI HAI, …………. I LOVE KISHORDA I LOVE KISHORDA I LOVE KISHORDA I LOVE KISHORDA I LOVE KISHORDA I LOVE KISHORDA I LOVE KISHORDA …. Kishore Kumar Ganguly….a name which has become somethin more than just a mere example of an exemplary and anointed music..which always soothed the soul…is actually also a persona which had its own ways of tackling the toughest phases of life… his humour and his music all covered up the ocean of pain in his life..he brought when he was goin through the worst phase of his life… he died and left his songs, a shadow of his own life..to make us learn how to live. Kishore kumar has almost been a music teacher and a demi God to me..as since when i know myself.. i have heard his unmatched hindi and bengali songs(in the tape recorder)…and always thought..one day may be..ill be able to sing like him..(though thats a fallacy to even think so).. and i also hope by listnening to his music..that i will walk with ease and ingenuity in every stage of my life..just as our KISHORE DA..
I’m very very happy i’m signig kishorda song because kishorda song is very hardly tacheble.as mera jevan kora kagaj kora hi rehgya.remjem gere sawan ulag sulag jaey man,gindgi ke safer me gujar jate hain.this song very very hard.Ese kehate hain dil ko chu jane wale song.I AM VERY PROUD OF YOU !Because you are a fabulace singer.I MISS U KISHRDA. Can any one fo you please tell us in detail about the populaity of Guru in your country?? Does there exist a “school of music” inspired by Guru there just like India(Sanu,Abhijeet,Babul etc.)?? Any activity regarding guru happening there??? I am also his fan since my childhood, especially becasue of his comedy acting . Kishoreda and Mehmood ji were perhaps India’s top two comedians with due respect to Jhony Walker ji, Keshtoji and many others who were also great in their own right but I am one of the craziest fans of these two.If anybody ha not seen Pyar Kiye Jaa, please see it and will agree with me. Can anybody be so versatile in singing also. I think his acting abilities played a very big role in bringing perfect expressions and feelings in all the songs sung by him. Since I have gain wisdom; Kishore Kumar Sahib has been the only motivation personality for me…I love him…his voice, his style, his delivery, his magic makes this universe a beautiful globe….He will live forever……Kaash….Ever….ever I tell Amir Kumar Sahib, how much I love his father…….Shahab Hussain (Lahore: Pakistan).